Our new Jayco Journey has a double bed and set of bunks. Battery pack & Anderson plug for on the go charging. There's also stereo with indoor and outdoor speakers. Mattress protectors are on all beds. Need to bring your bedding. All cuttlery, crockery ect are already packed and ready to go. If there is anything else you require please ask. This van is a beauty. Please let me know what size plug your car has to ensure the correct adapter is available if required. Van is to be returned in the same way it left us in. Additional cleaning charges will apply if required. Please ensure any damage is reported so we can have it fixed asap. Delivery set up and pack up can be arranged at an extra cost depending on location. Long week ends are a 4 night minimum. Set up video can be viewed here. Please treat our caravan like its your own. Report any damage or issues regardless so we can get them fixed up asap. Additional cleaning fees apply if it is not clean upon return. Roadside assistance included with Jayco road side assistance . 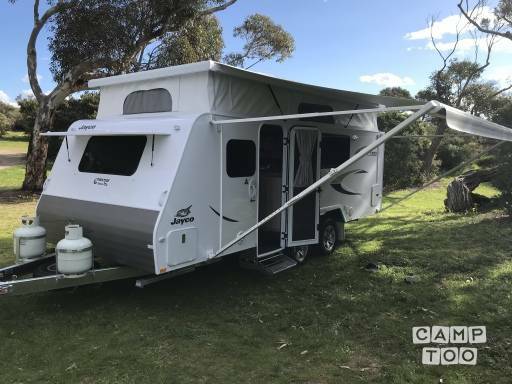 We rented Ebony and Brads 2018 Jayco Journey from 27/12 - 4/1/19 for a family trip to Bright. The whole exprience with Campton / Ebony and Brad was really easy and relaxed. They were very helpful as we had never rented or towed a caravan before and made the whole experience relaxed and easy. We had a couple of problems at the start of the holiday and everything was handled quickly and efficiently. They bought a portable brake controller to accommodate us and future hirers at areasonable rate and assisted in the drop off of the van, which was much appreciated. I would highly recommend Ebony, Brad and their lovely caravan to anyone. The caravan itself is almost brand new and really well fitted out for a family of 4 - The bunks are a little small for older kids but other than that it has everything you would need. It towed very easily and was easy to set up and take down after a run through from Brad. My wife loved not having to trudge to the toilet block in the middle of the night and the toilet was easy to empty and manage. The aircon worked really well as it was 35-40 degrees most days. The fridge/freezer is huge and the stove and microwave are really efficient although we cooked outside mostly. There was plenty of storage space in the van and the bike rack was excellent. We rushed off on hols and didnt check all the utensils etc. Could do with a few more sharp knives, salad bowls and chopping boards etc, however, it didnt matter to us a we were away with a few families with a communal kitchen. The whole process of renting a caravan from Ebony was straight forward and ensured an enjoyable experience. From the pre-pickup communication, to a handover process when we hitched the van to our vehicle and finally a seamless drop off process. 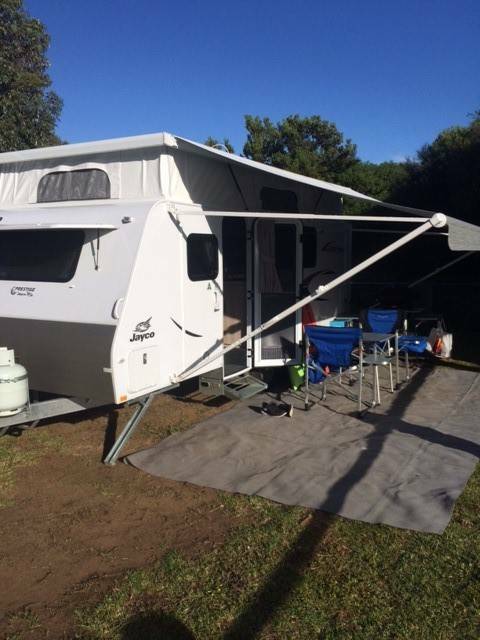 The Jayco Caravan we hired from Ebony was in excellent condition which ensured a great holiday at our stay in Wye River. If you are contemplating hiring a caravan I would highly recommend hiring a caravan from Ebony. You can pick up the caravan in Mount Duneed at Ebony's place.